With a population of 27,265, Stockbridge, Georgia stretches 13.44 square miles across Clayton County. Stockbridge is the gateway to Clayton County and is the proud home of Panola Mountain State Park, Merle Manders Conference Center, and two beautiful golf courses – Rum Creek Golf and Eagle’s Landing Country Club. Stockbridge is conveniently located 20 miles south of Atlanta off of I-75 and I-675, and while the city continues to see tremendous economic growth, it still maintains its small town hospitality for residents and visitors alike. Living in Stockbridge gives you a perfect place for outdoor adventures, as it is full of parks such as Panola Mountain State Park, Clark Community Park, Gardner Park, and Memorial Park. The parks feature several acres of lush landscaping with playgrounds and picnic areas. The City of Stockbridge is proud of their community events they hold each year. Their most anticipated events are Bridgefest, Screen on the Green, Holiday Gala, and Sounds of Summer concert. Whatever food delights your taste buds, you will be able to find it in Stockbridge. They are well known for their wide variety of Mexican food restaurants such as Frontera Mex-Mex Grill and Ranchero Mexican Restaurant. After grabbing a bite to eat, shopping is a must in Stockbridge. Be sure to visit Southlake Mall which is just a short drive from your new home. The area of Stockbridge is home to 44 public and private higher education institutions within a 20-mile radius, making it a convenient location to call home for students of all ages. Stockbridge is served by the Clayton County School District including Mount Zion Elementary, Rex Mill Middle School, and Mount Zion High School. Continuing your education is a breeze in Stockbridge with several colleges and universities close by. Georgia State University, Clayton State University, Strayer University, Atlanta Baptist University and Georgia Institute of Technology are among the wide variety of higher education options. The economic growth for Stockbridge, GA has risen tremendously over the past years and continues to grow at a rapid rate. Stockbridge is located 20 minutes from Southeast Atlanta, which is home to the world’s busiest airport, Hartsfield-Jackson Atlanta International Airport (also one of Atlanta’s top employers). Other major local employers include Delta Airlines, Clayton County Schools, Piedmont Henry Hospital, Wells Fargo Operations Center and Southern Regional Medical Center. Aspen Square is proud have an apartment complex in Stockbridge, GA – Retreat 138. Retreat 138 offers one, two, three and four bedroom apartments for rent in Stockbridge, GA. With all of our amazing floor plan options, you will be sure to find one that fits your needs! Retreat 138 also offers private laundry rooms with full size washer and dryer connections and appliances, walk-in closets, and spacious open layouts. Apartment kitchens are open concept with white cabinetry, granite-style countertops and stainless steel appliances. Your pup will love our apartments because we’re pet-friendly! We accept breeds of all sizes and dogs are welcome to have fun in our off-leash dog park with agility obstacles. 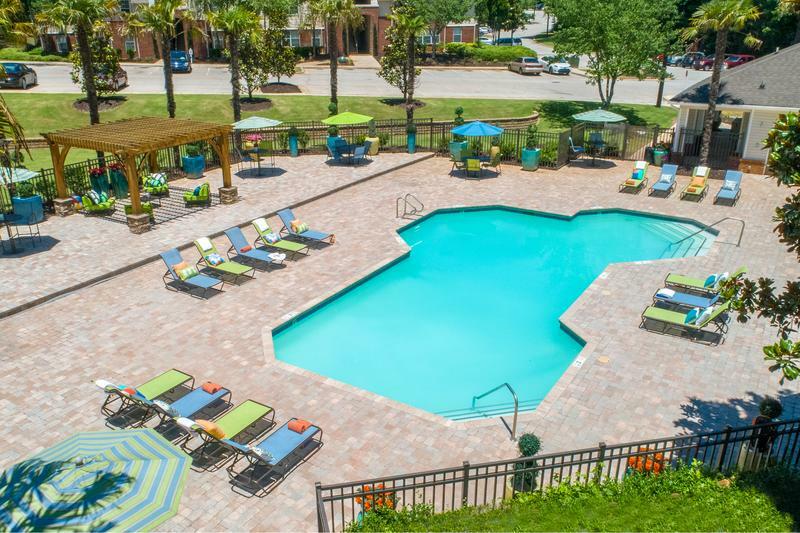 Enjoy other amenities such as a resort-style swimming pool with an expansive sundeck where you can relax in our lounge chairs or hammocks. When you’re in need of finding focus and getting some work done, visit our business center, or if you want to enjoy lunch outside with the family, you’ll love our picnic areas. You’ll never need a gym membership again because our on-site fitness center has cardio and strength training equipment as well as free weights. Embrace life at Retreat 138 and learn more about our apartments in Stockbridge, Georgia.